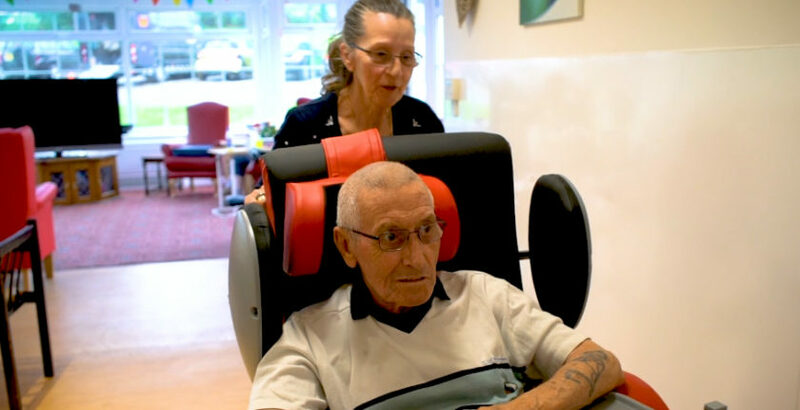 Hoisting transfers have been halved at a Shropshire care home following the introduction of specialist mobility lounge chairs. The transportation and hoisting of elderly residents at Bradeney House Nursing Home outside Bridgnorth has been made easier and more comfortable thanks to Your Mobility’s bespoke Chelsea chairs. Dan Bridges, Manager at Bradeney House, said: “I was looking for innovative ideas to raise care standards and enhance the wellbeing of our service users, as they’re sat down for very long periods of time. “As with many care homes, time is of the essence and the team has to use their time proactively. With the chairs provided by Your Mobility, staff are finding they have more time to tend to patients’ needs. We’re able to help them into their chairs in the morning and then not have to hoist them so many times from chair to chair throughout the day. “It’s about enhancing an individual’s life by ensuring we can do as much as we can to enrich and empower them. The portable, dementia-friendly chairs are multi adjustable and tilt in space, meaning users don’t need to be moved from chair to chair around the home. They also weigh just under 35kg, making them easily manoeuvrable and adaptable to various environments. As well as supplying specialist chairs, Your Mobility also provides free training on using the chairs, such as on fall prevention, good posture and pressure relief. Watch here to see the Your Mobility’s chairs impact on residents.